A Fate Worse Than Death. The place no one wants to visit: a torture chamber, brainwashing program or place of punishment so terrible that it is spoken of only in whispers. No one knows just what is done there; those who are sent there either never return, or else are so traumatized that they cannot speak of the torments they experienced there. The Trope Namer is the room in the Ministry of Love from George Orwell's Nineteen Eighty-Four, where it is eventually revealed that those sent there are made to literally live out their worst nightmares. No matter what spark of human individuality you're clinging to—whatever hope, love or loyalty—you will betray it in Room 101. And then you will cross the Despair Event Horizon, irrevocably. As one character says, "You really do mean it, and nothing is ever the same afterward." When the threat is used humorously, it can sometimes be known as the Maximum Fun Chamber, or involve Cool and Unusual Punishment and Suckiness Is Painful. Often, the audience has to Take Our Word for It that You Do NOT Want to Know what happens within. May also involve Animorphism. The widespread presence of these places in an Evil Empire may or may not be a sign of Industrialized Evil, depending on how personalized they are. If Room 101 is alive and has elements of the supernatural, then it could be an Eldritch Abomination. The name of the Orwell room inspired a TV series of the same name, in which celebrities sent their pet hates (including, in one controversial case, the Welsh) to Room 101. Can be a Sealed Room in the Middle of Nowhere. Can also overlap with Place Worse Than Death. No relationship to Subject 101 or Class Is in Room X-01. Or Room 222, for that matter—unless the Ministry of Love knows the single episode of a soap opera can drive you nuts. This sort of torture shows up a lot in film and television because actual torture tends to be pretty simple and brutal. Showing someone getting beat up doesn't make for very interesting drama, while having icy interrogators making vague but chilling threats about "your worst nightmares" or "destroying your will to live" is much more fun to watch. In Hollow Fields, underachieving students are sent to detention in "The Windmill". No-one who goes in ever comes out again. Which is because the teachers are using the children sent there as test subjects for a Grand Theft Me experiment. They sort of... Break... In the process. Mahoraba has Shirogane's own Room 101 inside her classroom for students who misbehave in class or failed to do homework. When not in her classroom, she might borrow some random room for dealing punishments to her students. Played for laughs, misbehaving students are just heard screaming by other students and comes out pale as a ghost with no one ever willing to say what really goes on behind those doors. 20th Century Boys: People who resist being brainwashed at Friend Land (which is already bad enough) are sent for more advanced treatment to Friend World, which is never actually described. Fables has a group dedicated to removing the fable characters from memory. One of their punishments for fables who get out of line is what looks like a pit. Apparently being inside causes people to simply forget your existence, which for a fable can mean they simply fade from existence (Paul Bunyan was reduced to a midget after multiple trips). In the classic (Earth 2) Batman story "The Autobiography of Bruce Wayne", the Scarecrow crashes a wedding that Bruce is attending, and hits the congregation with fear gas, causing everyone to relive their worst fears. When Batman suddenly sees his allies (Robin, Batgirl, Commissioner Gordon, Superman) disappear before his eyes, Scarecrow actually mentions this trope by name: "So, Batman, your greatest fear, your Room 101, is autophobia!" Michael Radford's film adaptation of 1984 successfully translated how much Nightmare Fuel Room 101 can be. The interdimensional gateway drive used in the 1997 film Event Horizon. This gateway was an interdimensional jump drive that could travel instantaneously to any part of the universe, unfortunately, the ship would travel through a parallel dimension analogous to Hell. Room 217 in Stephen King's original novel. Why the change? The hotel used for filming the exteriors had a real Room 217, and the owners were afraid no one would stay there after seeing the film. V for Vendetta, no one knows what happens to the people who are black-bagged...except of course for the ones who enact said black-bagging. And V, who escaped, and Evey, who was put into a fake interrogation by V.
While never specifically revealed, there is some speculation that the cube in the Cube movie series is one of these. Even if you manage to live through the deadly deathtraps of death, the massive psychological horror experienced within might make you wish you hadn't. Rather hilariously, Room 101 was named after a conference room at the BBC, where George Orwell had to sit through boring meetings. "If it's any help, I can't stand moths." "Moths?!" Esmond screamed. "What do you think we are, ruddy Harrods? We can't get moths for love nor money!" "Comes in here asking for moths," muttered Esmond's assistant. The room 1408 in the Stephen King short story and movie adaptation of the same name. The "Objective Room" in That Hideous Strength by C. S. Lewis is a sort of mental torture. At a glance, it's an unremarkable room, but the closer you look, especially at the pictures on the walls, the more unpleasant it gets. Subverted in the The Hitchhiker's Guide to the Galaxy - the Total Perspective Vortex is a machine that causes the soul of whomever gets put into it to commit suicide by showing them how insignificant they are in the universe, but when Zaphod Beeblebrox goes in, it turns out that it merely reveals he's the most important thing in the Universe. This is later attributed to this all occurring in a universe specially created for him, where he truly was the most important person in the universe (go... read the book). At any rate, he's pissed off enough at Zarniwoop for first abducting him and then bursting his bubble about how he survived the Vortex that he eventually slugs him. In Poul Anderson's "Sam Hall," the story opens with the protagonist's nephew being arrested and sent to a Room101; the protagonist must hide that they were related. The Pilo Family Circus has its own Funhouse, a place that even other circus employees avoid, as it's the home of the Matter Manipulator, a flesh-sculpting magician responsible for the creation of the Freakshow. Carnies are sent there as punishment for suitably unpleasant crimes, and visitors to the show that actually enter are never seen again. The only example we see of a victim of the Matter Manipulator besides the freaks is Winston the Clown, who has the flesh of his stomach ripped out and replaced with hot coals. Shayol, the prison planet in Cordwainer Smith's Instrumentality of Mankind stories, named after Sheol (the Hebrew name for the Underworld). In the actual story 'A Planet Named Shayol', it is revealed that the planet hosts a virus which causes those infected to become immortal, but also to become painfully mutated and grow new limbs, which the Instrumentality harvests for replacement parts. The HQ of the Cable Street Particulars in Night Watch, one of Discworld's darkest moments. Another dark moment: the Girls' Working School/Grey House in Monstrous Regiment. And some of the places the inmates get sent on work hire. In the novel Hell House, the whole mansion qualifies, but over it all seems to be the ballroom, to the point Ben Fischer makes it a point to try avoiding it. The book The Mysterious Benedict Society has the Waiting Room: so horrible that even those who have never been there cringe in fear of it. one of the main characters gets sent there, and it's just a room full of mud and insects; nevertheless, he is nearly broken by it. Later, Milligan gets captured and sent to it and it turns out to work to the party's advantage. He is able to hold his breath and sink down below the mud and then escape. Crowden, the big bad of Witchfinder: dawn of the demontide, has a demonic cabinet, into which he places people to be tortured. One incredibly unlucky victim had to spend a month inside it. Dungeon Number One in Magyk. It is essentially a huge chimney-like pit full of rancid water that drowns most of its inhabitants...if they survived the fall, that is. In Shades of Grey, people whose merit score dips down low enough get sent to Reboot, where they supposedly are retrained to fit into society. It turns out to just be an 'abandoned' town with a town hall painted with a color that kills you. The danish fantasy series The Shamer Chronicles featured a room that was covered head to toe in carvings of faces that would whisper the worst things you could imagine to you - remind you of horrible things you have done or play on your insecurities until you were driven mad. In the Wheel of Time series, the Aes Sedai have one of these underground in Tar Valon. Thieves brave enough to try to rob the place get sent there, and are quietly released the next morning, apparently unharmed but never trying that again. We find out later what it is: You're strapped to a block and the local magic really does give you immersive hallucinations of your worst fears. This is what Teddy assumes the lighthouse is in Shutter Island. In the novel Unwind by Neal Shusterman, the main characters are running from the law because they are scheduled for unwinding. The room where the unwinding takes place is one of these, except everyone knows exactly what goes on, just not how. In The Dream Catcher by Monica Hughes, about a society of telepaths in a domed city, misfit Ruth is sent to The Black Hole, a room with a terrifying reputation for stories of people who'd be driven mad from just a few minutes inside it. Subverted when, it turns out all it does is block telepathy. Most telepaths can't handle it, but Ruth actually finds the place pretty relaxing, and the door wasn't even locked. It was actually a test to see if she was the type of person who could survive without being connected to the telepathic community. The house where the narrator is kept in The Yellow Wallpaper. Justified, as it used to be a Bedlam House. (And in a way, it's still being used as such because she is there to recover from hysteria. Needless to say, her being kept in a house (and especially her bedroom) that she thinks could be haunted does not help her. Animorphs drops some mentions to Visser 3's personal torture chamber aboard his Blade Ship. For his underlings even death from starvation is much more preferable than ending up in there. Cell 25 in Michael Vey: The Prisoner of Cell 25. The humorous BBC chat show Room 101 where a celebrity comes on to talk about their most hated things, which can and will include anything and everything, whereby they make a case for their hatred and if successful, the item is dumped into Room 101 itself. On an additional note, the most hated thing is apparently packaging, as it's been brought up on the show seven times, more than anything else. Room 17 in the Babylon 5 episode Intersections in Real Time. Beautifully subverted by the Dangerously Genre Savvy interrogators themselves: It is just a threat meant to use that trope. Room 17 does not exist, it is merely a way to unbalance the subject before standard interrogation and brain washing techniques resume, while robbing them of any hope for a quick death. The real horror of Room 17 is simply that there is no end, no exit, no hope. Room 9 from season 2 of Heroes. Maury's appartment where Matt Parkman and Nathan Petrelli are trapped within Maury's illusions of a twisted alternate of the S1 "Bomb" Future. Topher: You know that feeling when you have a name on the tip of your tongue? Well...that's what it's like. For every thought you never have. The Sadist Teacher 's classroom in Ned's Declassified School Survival Guide is indeed room 101. The red bag on British sitcom Ideal. To put it in perspective, gangster Psycho Paul was said to have 'cried like a little girl' after looking inside it, and even Ax Crazy hitman Cartoonhead is scared of it. The Professionals. Bodie and Doyle lampshade this trope after capturing a hitman who refuses to say who employed him. So they take the hitman to the business of an East End gangster whose brother he killed and handcuff him to a lamppost outside. "Oh he won't kill him. But he'll wish he had." The hitman wisely decides to talk. A terrorist played by Quentin Tarantino in Alias had a portable version of Room 101; "The Box," which kept threatening to open if he didn't get answers. It turns out it was full of needles spiked with something that would cause a terrible burning sensation that he'd jam into the fingers of his torture victim; painful, but at the same time, not exactly up to the massive hype he built up. Roswell: The FBI Special Unit tortured Max inside "The White Room". La Femme Nikita: Section 1 had a cell known as The White Room, where captured hostiles were routinely subject to torture, interrogation and "Cancellation". In The Sarah Connor Chronicles, Skynet's machines operate one of these in the basement of an abandoned house in the wasteland. Precisely what happens down there is never made clear, but Derek Reese is subjected to whatever it was they did down there. Creepily enough, coming from said room is the sound of a dpiano playing a particular song by Chopin - the same song is playing an episode later while Cameron is ballet dancing, and later on in the series it is revealed that Allison Young, the girl whose face and identity Cameron stole, had a mother who liked that same song. Coupled with Derek Reese's familiarity of and hatred toward Cameron, and there is a strong implication that she's tied to this particular instance of Room 101. Played absolutely straight in Doctor Who episode The God Complex, featuring a space prison resembling a hotel. Each inmate has a room which contains their worst fears, and a Minotaur-like monster that feeds on the inmates after being subjected to them. The Doctor thinks the Minotaur is feeding on their fear, but it is revealed the purpose of the rooms is to force the inmates to reveal their faith in someone or something to protect them, and that is what the monster manipulates and feeds on. There's also Floor 500 on Satellite Five, from the episodes The Long Game and Bad Wolf. Slightly subverted at first, since everyone wanted to be promoted there, but eventually revealed to be a place of horrors. The Trope Namer example is mocked in an episode of The Goon Show called "Nineteen Eighty-Five! ": Protagonist Ned Seagoon is locked in a room and forced to listen to a recording... of himself, singing (Harry Seacombe, actor for Neddy Seagoon, was in fact a very accomplished opera singer). And in The Burkiss Way, Room 101 contains the show's recurring irritant Eric Pode of Croydon. Exalted has the Monstrances of Celestial Portion, which is like this to the Solar Exalted. Yes, even the immortal god-kings of Creation have something that makes them scream in fright. What are they? The Deathlords traded some favors to the Yozis to create an engine that would invert a Solar Exaltation's nature and make them serve the cause of death, turning those bestowed with it into the Abyssal Exalted. And if a Solar's stuck in one of them... well, it ain't pretty. Hell, a Solar can't even look at one without feeling sick. Likewise, Werewolf: The Apocalypse has the Spiral labyrinth, which werewolves are forced to walk to turn them into Black Spiral Dancers (except in one notorious case where that didn't work, and Celeste Walks-The-Spiral-Backwards destroyed the labyrinth instead). Mage: The Ascension works on reincarnation of every mage's avatar, but has a horrid ritual to destroy avatars. And Vampire: The Masquerade contains a few fates worse than death because all the vampires are, of course, already dead. Also from Mage, the Cauls, which invert a mage's avatar, turning them into one of the Nephandi, mages dedicated to corruption and destruction. For that extra nasty twist, when a Nephandi dies, it's possible for their reincarnation to be born with their past life's twisted avatar - corrupted from birth. 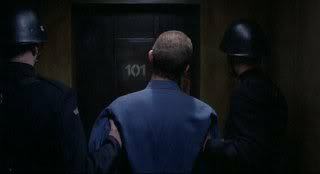 Heck, in Mage: The Ascension the Technocracy Convention NWO actually HAS a Room 101, in direct homage to 1984. Warhammer 40,000 brings us Commoragh, home of the Dark Eldar-a planet-sized extradimensional City 101, which is as horrible as it sounds, since its residents live on Squick. And then, anything there is owned by the Inquisition. Dr. Dominiani has a whole asylum floor full of these in his domain of Ravenloft, which he uses to systematically drive people mad. In Kult, The Abyss, a great chasm where Demiurge's citadel once was. Only Astaroth has ever been known to get in there and return, but only barely alive. And he refuses to speak about anything inside that place. Urinetown in Urinetown has this reputation. It turns out, though, that there is no Urinetown; those who are sent there are just thrown off a building to their deaths. The Punishment Sphere facility from Sid Meier's Alpha Centauri. Drones—the uneducated, disaffected unskilled worker class—will never, ever riot if you have one of these. It's never explained what's done (though according to the sound file that plays when you build it, one man who was tough enough to take it quickly broke when his wife was put in...), but whatever goes inside must be really, really, really nasty, because building it also halves that city's scientific research output and prevents citizens from becoming Talents, the educated and creative class, which also prevents that base from ever entering an intellectual Golden Age. The game also references "nerve stapling" as the dictatorial method of quashing Drone Riots. Nerve stapling is implied to lobotomize its victims into mindless workers. Not necessarily gruesome per se, but certainly a flagrant violation of human rights nonetheless (and a horrific punishment by any measure). In fact, using the Nerve Staple option to "calm" your populace is considered an Atrocity by the other factions, and will temporarily do horrible, horrible things to your economy as everyone stops trading with you for several turns (which can be devastating for any faction that relies on trade routes and external income, as in the other Civ games) and you get temporarily chucked off the Council. If you manage to get the UN Charter repealed by the Council, then it is no longer considered an atrocity to nerve-staple people or use nerve gas on civilians. Planet busters are still a no-no. In Dragon Sun by Michael Ely, nerve stapling is developed by Yang's scientists in order to more effectively control his population and create a nigh-unstoppable army. When the others find out about it, they are utterly horrified and put Yang in jail for life. The victims they find have some sort of electrodes in their heads used to induce intense pain. When a rival faction is defeated by the player, a short clip (one for male, female, and Progenitor) shows that leader in a punishment sphere. This example is combined with Human Resources, Brainwashed and Slave Mooks, to create a wonderful place for a nice, quiet picnic. Killer7 has the Forbidden Room, which may or may not be the source of the horrific screaming and moaning heard in the building throughout the game. Eventually it seems to contain Kun Lan and Harman, the entities who rewrote Garcian's identity, shaping him into a pawn in their endless metaphysical battle. Echo Bazaar has a Room 101 in the evil hellhole that is the Orphanage It actually contains nothing worse than mops, its a store room. In BlazBlue, this is what can be described as Relius Clover's Astral Finish: Sending people to the Room 101 that is his lab. Vault 101. Where no one ever enters, and no one ever leaves. Despite the name, this trope is somewhat Averted with Vault 101. Considering the post-apocalyptic wasteland right out the door, and what the other vaults were like, it isn't actually that bad by comparison. Parodied in Invader Zim, where Zim opens a wormhole and had several options of places he could choose from to send his rival Dib. Out of all the unpleasant places he could send Dib and the rest of the class, he chooses... A ROOM... WITH A MOOSE! Also parodied in Animaniacs - Satan takes the Warner siblings to a room of "agony worse than all others," which turns out to be "whiny protest songs from The Sixties." "The Earth King has invited you to Lake Laogai." This page was last edited on 10 April 2017, at 02:15.